7 min to Breck & 5 to Keystone! Elevator, Hot Tubs, Frplc, W/D, Sleds, Shuttle! Our condo is in the only Marina Place building that has an elevator. The elevator is conveniently located to our condo so you can bring up groceries, skis, wonderful! For a limited time, if you book with us we will provide you with a complimentary Silverthorne Recreation Center pass! Breathtaking views of snow-capped mountains and beautiful lake Dillon from two sliding glass doors. Walk to one of the excellent Dillon restaurants or après ski around the cozy wood burning fireplace after visiting one of six world-class ski resorts or Nordic centers. Snowshowing, sledding, or x-country skiing outside the door in winter and biking, sailing, SUPing in the Summer. Less than a ten minute drive or hop on the Summit Stage for a free ride to ski lifts, restaurants, outlet mall. Friday farmers market in Dillon is a block away! Two car assigned covered parking spaces with elevator makes moving in/out easy! Wow, what a great week! 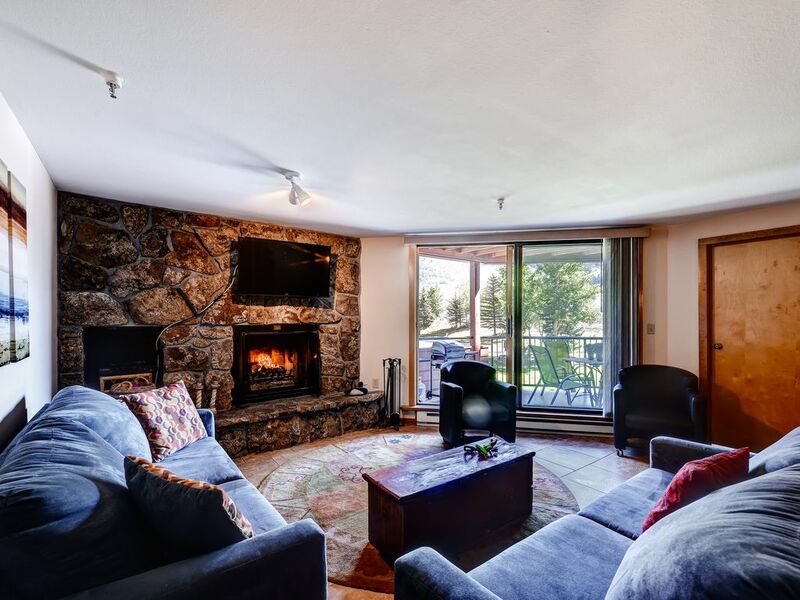 The unit was wonderful, close to the slopes, and many amenities. Our family had a wonderful time skiing and relaxing in the hot tub. We took in a great diiner at the Italian Restaurant just up the street. Thank you for your hospitality and for making us feel so welcome! What a wonderful weekend! We took our time riding to Frisco, great breakfast at Betterhorn. The Friday farmer’s Market in Dillon was great. We stocked up on so many beautiful veggies we barely needed to go the store! On holiday from the UK, spending 6 nights up here in the mountains. Lovely condo - we have had 3 fabulous & sunny days skiing. We had Christmas day in the condo with a tree & traditional dinner. Celebrated my husband's 60th birthday. Loved the hot tub. The Kennedy Family. Had a wonderful relaxing time while we were here. The boys took advantage of the pool & hot tubs. I have been vacationing in Dillon for over 22 years and my family and I love, love, love it! This location is the absolute best! I love to take an early morning bike ride around Lake Dillon and have a snack at the Arapahoe Cafe! Delicious! I enjoy shopping for fresh fruits and vegetables at the Farmer's Market during the summer months and I enjoy the hot tub and playing games in front of the fireplace on Winter evenings. Basic cooking items, flour, sugar, vinegars, salt, pepper and random other items. Modern white china, lots of wine glasses, juice glasses. Well supplied kitchen with small appliances, Keurig coffee maker, crockpot, mixer, toaster handy. Also included are basics supplies, garbage bags, Press n seal, sandwich bags, aluminum foil. We have a nice dining room table with chairs for 6.
overlooking lake/mountains and off of the living room and the master bedroom. Kayak rental a few steps away. Rental bikes just a few blocks away and bike path just outside building. Boat rental, sail, motor, pontoon a few feet away. Courts only a few blocks away. Numerous courses in the area. You can get our of your car, go a short distance to the elevator and ride it up directly to our front door. Just steps from our condo! This is my second stay and will be back again. Great condo with a view! The unit was exactly as described. It had a wonderful patio overlooking one end of the lake and the mountains. The patio has four nice chairs and a table… As well as a barbecue grill. The kitchen was very well appointed. Had everything we need to cook several meals. There were plenty of linens… Lots of towels, hand towels, etc. The beds were very comfortable and the sheets were soft. There were lots of movies, books, games, video games, etc. There were two folding chairs which we took to the concerts. The closets had all kinds of useful goodies in them! Nancy was wonderful to work with… She responded to me almost immediately every time. We highly recommend this condo. Thank you JANET for your super kind words! We would love to host you and your family again some day! Loved the place and the location. Nancy was very responsive and helpful. WiFi was slow and the upstairs neighbors would wake you up with their ski boots at 6. Everything else was perfect and would recommend this place. Great place! Perfect location for our ski trip. Great location for our ski trip. Clean. Loved the wood burning fire place. This property was great for a 2-3 day ski trip at the nearby resorts. Hot tub was nearby the unit as advertised, and the rooms were comfortable. Only thing I would add is a standard coffee maker, vs the Keirug. Thank you for the feedback Chris! The condo location & condition was excellent. Thank you for staying with us and for your kind remarks! We do not accommodate long term rentals during the high-season (ski and summer). Two week maximum. Thank you.